I’ve lived in Aspen my whole life and I can’t imagine growing up somewhere that didn’t have skiing. 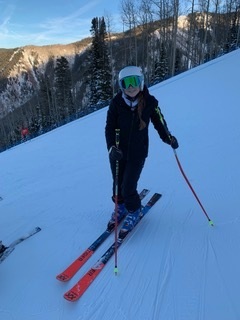 I’ve ski raced for seven years now, and my favorite part of it is getting to be outside and in Colorado’s beautiful mountains. Skiing is what makes our town so special, and brings us together as a community. My favorite parts of the winter are when World Cup is sometimes here, and going to watch X-games. It’s so fun to be able to watch our favorite athletes right in our hometown. Being able to leave school and get on a ski lift right away is the best part. I love being outside more than anything, and skiing is such a fun way to enjoy the outdoors. I want to go to college in California and although it’s not a five minute drive to the best mountains, a five hour drive would be good enough. I ski as much as I can whether it is training gates after school or free-skiing on the weekends. These past few years I have really noticed a difference in our winters. We need to realize that what’s happening is real, and we need to make a change. It’s hard to think about how our winters could change if we don’t start making a difference. I love to ski and I hope everyone else's love for skiing brings us together to make a change. Website built by Colt . Photography by Moms and Dads.